Gobblet on the GO is the travel version of Gobblet Jr, to have fun while using memory and strategy away from home. 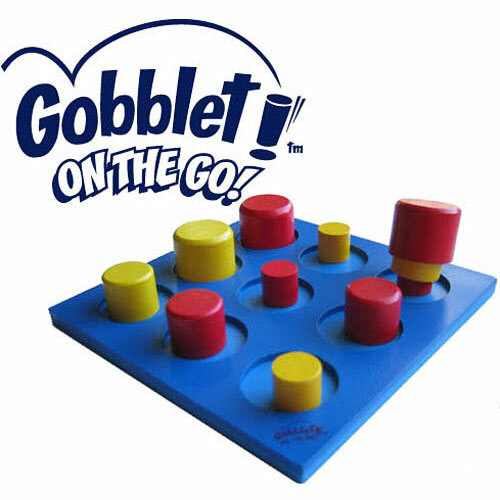 Easy to learn, Gobblet on the GO plays just like tic-tac-toe except that you can gobble up your opponent's pieces and move yours around the board. Fast to play, it is the best first strategy game for 4 year-old children. Be the first to line up 3 pieces in a row and you win! Very convenient, the wooden board and pieces come in a beautiful little bag. Game Facts: Ages 5 and up, 2 players, playing time 1 to 5 minutes. Measures approximately: 6.00 x 2.50 x 6.00 inches..